Six concentric terraces surround a central circular ‘arena’ connected by a series of stone ‘steps’ fixed to the retaining walls in a radial pattern, mimicking the rays of the sun. Six more surround them in an elliptical shape and another eight stepped terraces at the perimeter, span a portion of the narrow end of the ellipse, almost like a viewing gallery. There are more such elliptical terraced hollows adjoining this one! Were these ancient amphitheatres? Places for religious rituals? Or just brilliantly designed agricultural laboratories? 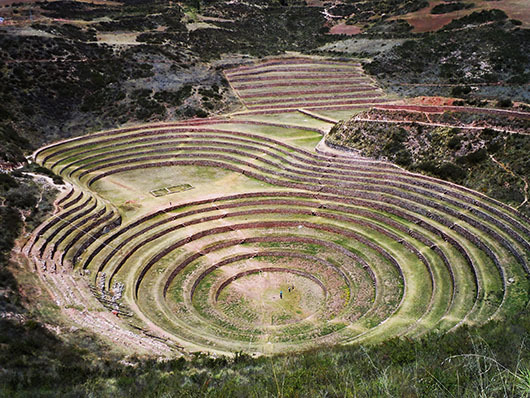 Scholars and engineers have long speculated about the significance of these surreal terraces in the Centro Arquelogico Moray – close to Cusco, Peru – ever since it was first photographed in 1931. The ‘agricultaral research station’ seems to be the most generally accepted theory, based on the remarkable features of the site. The fact that the lowest level (each level is about two meters deep) is perfectly drained and never gets flooded even after incessant rains. The amazingly engineered ‘micro climates’ in each level, with temperatures varying upto 15°C (27°F) between the top and bottom (apparently for experiments with different varieties of plants) And the elaborate, concealed irrigation channels. Why is this located in an area that has calcified soil and gets the least rainfall? Why is there no sign of the presence of other dwellings that would have been necessary to house staff working at an agricultural research center of this scale? Why does an agricultural site need the astounding acoustics that exist here? How did this – the only Inca monument that is not a building – survive practically intact, through the centuries? Why do the Quechuan people congregate here annually to perform rituals in honour of Pachamama or mother earth on the solstices, as they have been doing for centuries (as indicated in reports by early Christian priests in Cusco)? Why were there carved rocks or ‘Huacas‘ usually found in locations where offerings are made? Could this have been a place of religious worship and the water chanelled for ritualistic use? Could some channels have been used to pipe ‘Chica’ or corn beer as offering on special days? And what on earth was that strange phenomenon in the sky directly above our heads, only visible from the centre of the lowest circle? A kind of glowing halo with a darker center (that we would have missed if it weren’t for our guide)!!! Couldn’t capture it with my camera though. There are no answers, and till we solve these riddles we will have to settle for the most probable assumption for the original purpose of this mystifying engineering marvel. Makes you wonder, doesn’t it?!!!!! Not a cloud as much as a shadow with a lighter ring around it! I am sure there is a perfectly logical answer, once they solve the puzzle 😀 Thanks Marina. 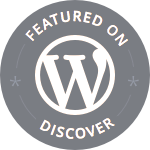 I had no idea these existed – absolutely fascinating and something for me to ponder today! Thank you. My pleasure Suzanne 🙂 Thank YOU. This is a less visited detour on the Sacred Valley circuit, usually combined with the salt flats at Maras Salineras. I think there are horseback tours to these sites as well! We loved the quiet and the isolation. So many questions and not enough answers, like Stonehenge in UK, but isnt that part of the magnetism, the mystery and intrigue. You are right of course Gerry! Without the mystery they are reduced to just a bunch of stones! My goodness, Madhu, that sure is one extraordinary series of leading lines! Congratulations on another wonderful, and informative post. Isn’t it fantastic that there are still some unsolved mysteries? I’ve never heard of this place before. It seems like the Incans have and will always surprise and fascinate us with their enigmatic relics. Truly amazing! Absolutely Bama! Their building skills are truly something to marvel at! A wonderful selection for challenge. Beautiful photos plus you have supplied great detail information about this site. I had never heard of this unusual place before. Thanks Francine! Glad you enjoyed it. So many questions we would like to be able to ask the Ancients, Madhu. These amazing places are so full of mystery. So strange, and so interesting, Madhu. Arent they? Thank you Bente. Thank you! Moray just takes a few hours and it is a short detour.You will love it. LOVE IT! So many questions still unknown, which makes it all the more mysterious! Amazing photos too, Madhu! So many mysteries in our universe. Brilliant post on leading lines! This is on my bucket list!!! My goodness! And to think they had this level of agricultural sophistication back then! I would have thought it was an amphitheatre, actually. Fascinating! Most people would from the pictures alone 🙂 Thanks Meenakshi. Will be over to check out your posts soon, am SO behind on my blog reading. Another place I’ve never heard of Madhu! the more I visit the blogosphere the more I realise what a wonderful world we live in. Me too Gilly! We would need several lifetimes to see them all! Hurrah ! Madhu and Mashaal in Machu Pichhu – kya baat ! But, first, you must come visit me in Istanbul when I shift there in few months – if all goes according to plan. What a delight it would be to meet you in person – a dynamic and intelligent lady and photographer. Jeetey rahein. Thank you again for another wonderful and illuminating piece that stuns and amazes us stay-at-home travellers. Thank you for taking us to another part of the world, Madhu! it’s so fascinating! What an incrdible place. I vote for the idea that it was a place for some kind of rituals or “shows” so some kind. Me too Angeline! Too many unanswered questions for it to be just an agricultural lab. Yes, hope someone can solve some of the mystery! Thanks Dadirri. Very interesting and mysterious place, Madhu. It really makes you wonder…. Oh yes it is Cathy! We were so glad we went there. Wow, Madhu–you take those challenges and really amp them up to the next level! This is a fascinating post, and one that makes me marvel at this species of ours, which accomplished so much, even centuries ago. Fascinating indeed 🙂 You took fabulous photos too 🙂 What did you like best on your trip to Peru? Were you there once or several times? Did you have problems with altitude? Thanks Paula. We just went once for a week. I liked too many things. Machu Picchu was the highlight of course, but the sacred valley was equally lovely and Cusco and even Lima! The people and food as well….I could go back to see more, and perhaps venture into the jungle. Awesome entry Madhu and clever interpretation of the theme. I finally did mine today but I’m not sure it compares to these incredible lines that I witnesses too when I hiked the inca trail. Oh thank you Nicole! I think yours is perfectly lovely! I had no idea the Inca trail passes through Moray! Thanks for unraveling another mystery of the world – amazing pictures and writing. One of the (old) 7 wonders of the world is Banaue Rice Terraces in the Philippines. Exactly what you showed here. And that one in the PHilippines is the original (it wouldn’t be including in the 7 wonders if not) and it’s nothing else but for agricultural. I know I should be patronizing from my own country…but I’m not going to lie, this one you showing us here is absolutely stunning. The Banaue Rice Terraces seem more like the Pisac terraces in Peru and the Longji terraces in China that are still used for agriculture. These are built like amphitheatres in hollows, not on hillsides like the others that demand terracing! That in itself is a mystery! Why hollow out the ground when there is no fear of erosion and go to all that trouble to drain out excess water? These were something new to me. I have to thank You for presenting these, because when we’ll travel some day to Cusco and Machu Picchu, then I remember ruins of Moray. Your photos are great and I love Your text very much. Fascinating! Another post well done! My first thought was that it was an amphitheater until I read on…but who knows. The engineering, skill and thought process is amazing, and even moreso when you realize they did not have the tools and technology available today. Thank you Fergie! Yes the Incas were very advanced for their times! It is an awesome place DJ! A wonderful mystery. Just like the pyramid. How did they build that out in the middle of the desert. We may never know. The fascination remains. It always does. About the pyramids…Giza wasn’t always a desert Judy. The Nile flowed right beside the Pyramids at that time and the blocks of stone were sent down the river during the annual floods!! Still a remarkable feat considering the massive size of those stones! Thanks for that, Madhu. I hadn’t known that. Your photos are spectacular. You have captured these so well. My husband enjoys reading and researching these types of things He enjoyed viewing your photos, too. Informative and picturesque. Thank you Noel 🙂 Glad you enjoyed this. I’m curious what your speculation is since you’ve been there. It seems to me that such an elaborate design would include stairs if it was intended for human access, but the stairs there don’t look like part of the original structure. Aren’t these levels like a foot taller than the average Incan man was? And why would someone intelligent enough to design this build irrigation where there is no water? If this were an agricultural site, shouldn’t there be a) more of them, b) further evidence of agriculture, like tools, buildings, rich soil, and c) some benefit to the design that would still be in use today? I’d have to see it for myself to try to guess what I think it really is, but it sure seems like there is a big piece of the puzzle completely missing. Yes Anne, and I, like you, don’t buy the theory that this is an agriculture research station for the very same reasons! In fact scholars are deeply divided over this. Hope someone can solve the mystery for us soon.